We had a big snowstorm last week and it remained cold for several days afterward. When I went to my home in the country, I found a lot of deep snow - especially in my back yard. But this past weekend, the temperatures started to rise and everything began to melt. 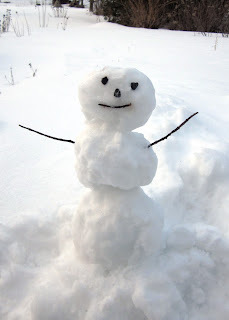 So I made this happy little Spring snowman to wave goodbye to the slowly retreating winter. Let's hope he is the last snowman of the season! It's melting, I swear it's melting!